The Cyclades AlterPath ACS4 ATP0170-001-001 console server provides enterprise and telecom networks with a complete, secure console management solution. When combined with integrated power management and centralized administration, the Cyclades AlterPath ACS4 (ATP0170-001) console server offers a secure and consolidated out-of-band infrastructure (OOBI) management solution. 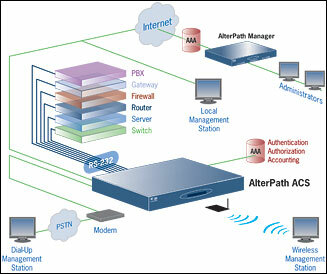 Using a hardened Linux operating system, the AlterPath ACS provides optimal performance, security and reliability. The Cyclades AlterPath ACS4 (ATP0170-001) offers advanced hardware features to meet the requirements of even the most demanding data center management applications. PC Card slots allow for enhanced functionality with support for many interface cards, such as modem (V.92 and ISDN), Ethernet, fast Ethernet (fiber optic) and wireless LAN (GSM, CDMA and GPRS). The AlterPath ACS also allows for automatic Ethernet failover by using a PC Card slot as a second Ethernet port, hence providing Ethernet redundancy. The Cyclades ATP0170-001 ACS's optional dual-entry redundant power supply (AC/DC) provides extra reliability, ensuring availability during critical times. Available in 1-, 4-, 8-, 16-, 32- and 48-port models that fit in 1U of rack space, the AlterPath ACS helps maximize IT asset productivity while providing scalability and reducing operational costs. Using the Cyclades AlterPath ACS4 for secure IT asset management decreases network maintenance costs while increasing efficiency and productivity. In addition to providing secure connectivity and remote access to cluster environments, the Cyclades AlterPath ACS4 (ATP0170-001) offers a wealth of security features such as secure clustering for console management of up to 1,024 devices, X.509 SSH certificate support, Secure Shell (SSHv1 and SSHv2) connections, TACACS/RADIUS/LDAP authentication and authorization, One-Time Password (OTP), Two-Factor Authentication using RSA SecurID, Extensible Authentication Protocol (EAP), PPP PAP/CHAP, PPP dial back, IPSec with NAT traversal support, IP filtering, user access lists per port and separate authentication to access ports and console server. These features allow data center managers and system administrators to remotely manage networks and servers with greater control and peace of mind.